Muskegon local aims to redefine customer-business relationships and foster new growth in the Muskegon business community. 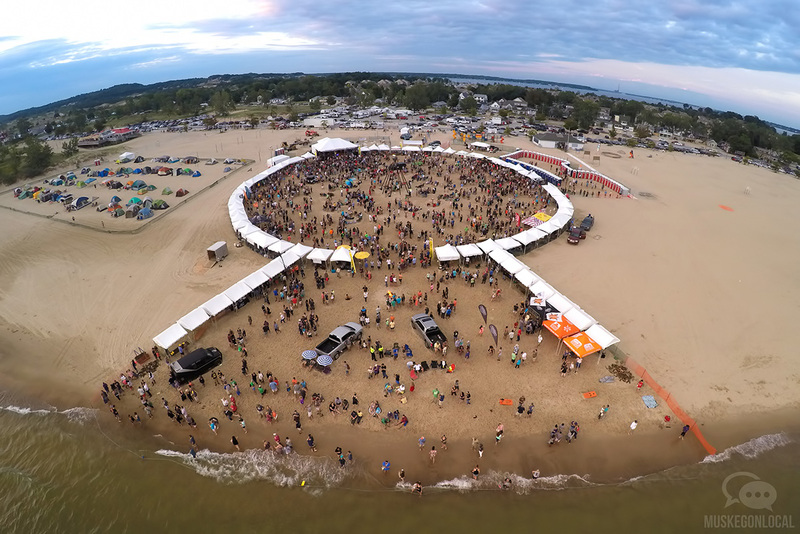 The 8th annual Muskegon Rockstock will be held on July 3-4 at beautiful Heritage Landing! This popular festival began in 2008 as a way to showcase the local music scene and has been getting bigger and better every year. The mission is to provide a rockin’ family event at a reasonable price that supports all things local. This years 2 day 4th of July celebration will feature lots of great food, Budweiser and Craft Beers, vendors, tried and true music and NEW this year, KIDSTOCK a Kangaroo Palace special event for kids of all ages! We’re giving away 20 pairs of tickets to this awesome local event! Check out the Muskegon Local Facebook page for more details! 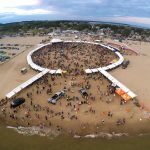 Muskegon Rockstock will take place July 3 and 4, 2017 at Heritage Landing in Muskegon, MI. Music, Fireworks, Raffles, Face Painting, and Food/Beverages will be available, featuring ice cold Budweiser. Here’s what you need to know: Tickets $5/day and will be available at the Heritage landing Box Office each night starting at 4:30pm or you can purchase them online and pick up at will call. Active Military and Veterans FREE and HONORED. Children 10 and under in free(must be accompanied by an adult). Kidstock opens at 5:30 each night, and requires an additional wristband. Gates open at 5pm each night, with an amazing Fireworks finale at dusk on the 4th of July. Event Details: Annual Festival lasts from May 24 through May 28, 2017. Tons of events for the whole family; a carnival, circus, ox roast, music, food and TWO nights of fireworks! (Friday, May 26 and Sunday May 28) Petting Zoo, and Memorial Day parade too. Check the website for the entire schedule of events. Save $5 on wristbands if purchased online ahead of the festival. 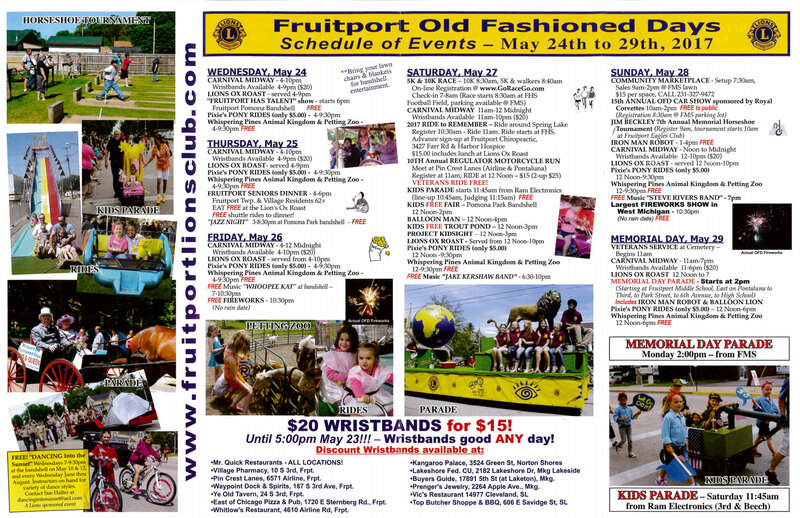 This year’s event will kick off with a talent show “Way off Broadway Fruitport Style” sponsored again this year by the Fruitport Leo Club. Applications for the event can be found on this website under the form tab, at the Fruitport Township Hall, in the Fruitport Area News, and at the Fruitport High School student services. This year’s bands will be as follows Friday night – Whoopee Kat Saturday night – Jake Kershaw Band Sunday night – Steve Rivers Band Fireworks will be displayed on Friday night and Sunday night both nights starting at approximately 10:30 pm. (there are no rain dates for either day). Shop all area stores for great specials and giveaways! Shop Hop; 10 – 5 p.m.